Snaring is an effective method to catch wolves and is a preferred method for Alaskan trappers. However, wildlife managers and trappers are concerned about the accidental capture of moose in wolf snares. Alaska Department of Fish and Game (ADF&G) biologists estimate that in areas with heavy trapping pressure, wolf snares catch up to 1% of the moose annually. Most moose caught in wolf snares die either at the capture site or subsequent to release. Since 1993, ADF&G and private trappers have developed and tested wolf snares designed to release moose and caribou but restrain wolves. Current testing and development by ADF&G biologist Craig Gardner shows promising results. By studying how moose encounter a wolf snare, Gardner found that incorporating two modifications to the snare resulted in fewer moose catches and fewer injuries to moose while reliably retaining wolves. Both modifications can easily be made by trappers or a commercial snare company on any wolf snare cable size between 3/32" and 1/8". The diverter is made by attaching a "diverter wire" to the snare so that it extends perpendicular to the snare loop at the top of the snare. 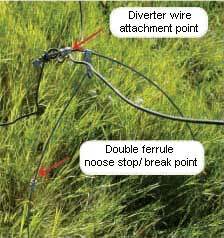 A moose will contact the diverter wire before reaching the snare, thus pushing the snare aside and/or knocking it to the ground. This is important in preventing nose catches, which are almost always lethal to moose, even if caught in a breakaway snare. This reduces injury to moose by preventing the snare cable from cinching down on the leg and by minimizing the breaking force for moose. It involves cutting the snare cable ‘inside’ the loop and inserting a double ferrule to re-connect the two cut ends. We refer to this double ferrule as the ‘noose stop.’ Exact placement of the ferrule is based on circumference measurements of both moose legs and wolf necks. A wolf neck is larger than a moose leg. The snare will fully cinch down on essentially all wolf necks. Thus, the snare will function normally on wolves. However, the snare will not cinch down on moose legs because the snare lock will come into contact with the noose stop. This contact will also create an increased leverage on the ferrule as the moose struggles. This mechanical advantage causes the wire to pull out of the ferrule and the snare will fall apart, releasing the moose. Field tests of the diverters and breakaway snares were conducted at the Kenai Moose Research Center (MRC) in Southcentral Alaska using semi-tame moose and in Game Management Unit (GMU) 20A, south of Fairbanks, Alaska using wild moose. An additional benefit of the new design is that the breaking force increases as the snare loop becomes larger, meaning that larger wolves will have to exert more force to break free with the noose stop/breakaway system. This is not the case for breakaway mechanisms that are dependent on the lock separating or S hooks pulling apart in which the breaking force is the same for moose and wolves. However, an S hook is an efficient breakaway mechanism and can be incorporated with a noose stop minimizing the chance of injury until the moose can break free. The diverter wires on the snare are constructed by attaching an 11-gauge wire to the snare so that it extends 28" perpendicular to the snare loop at an angle between 10 and 20 degrees from the top of the snare (see images). The diverter wire was attached to the #9 anchor wire with a ferrule. The breakaway portion is created by cutting the snare within the loop at 10.5" from the cable end stop and inserting a 3/32" double ferrule on 3/32" snare cable, or 1/8" double ferrule on 7/64" and 1/8" snare cables. The ferrule is then attached using the corresponding size swage tool. If a different breakaway system is used i.e. S hook or a modified end stop, only a stop needs to placed at the same location but the cable does not need to be cut. 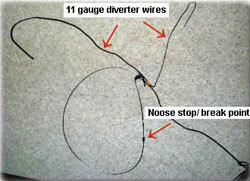 When using a noose stop, do not rely on a split lock design as the breakaway mechanism. It does not work because the lock has to spread to the size of the noose stop before releasing. Gardner’s research also compared accidental moose catch rates between 60" and 72" snare loops. Assuming that both size snares are set with the bottom of the loop 18" above the terrain, the top of a 72" loop is 3"(or more) higher than the top of a 60" snare. When walking, moose carry their head about the height of a wolf snare. The research showed a 17% catch rate for the 72" loops and a 12% catch rate for the 60" loops. Using small loops should help reduce moose capture. Even if a smaller loop size is used, however, a breakaway system and diverter should still be used. All tools and materials necessary to construct these snares can be purchased locally or through mail order suppliers. These snares may also be purchased preconstructed. Check the Alaska Trapper Association website for locations.